Keeping a household budget can become a real struggle for some of us, and some even believe that this is a waste of time. So why not take advantage of the benefits that technology offers and turn your Android or iPhone into a personal budget advisor that will help you spend your money wisely? There are many apps that you can check and see which one best fits your needs. Experts from 123writings have rounded up ten of the best apps that will make your life easier. You will be able to budget your upcoming expenses, save money and avoid the fees that come from late fees or overdraft. The PocketGuard budget mobile app is able to directly connect to your bank accounts. This means that you have at any time access to your current balance and transactions. The app shows you how much money you have in your pocket, how much you have spent and your income. The application continuously analyzes how much you spend to identify recurring payments that you have to plan and identifies your income to let you know what your cashflow is. Mint is another amazing budget app which takes the hassle out of making a budget. Simply connect the Mint app to your bank and it will automatically use your details to create a personalized budget. The app sends you alerts when there are unusual changes, will analyze your spending and send you tips on how to reduce money spent on bills and fees. Mint also has your credit score, which you can use to have a big picture of your personal finances and budget. The app also has a bill pay option so that you can pay all your bills in one place. The third option is GoodBudget, which is a digital envelope budget system. It uses the envelope budgeting method to help you manage your finances. The app can sync on all your Android and iPhone devices, so that every member of the family would know where money is going. GoodBudget can also show you how to save on big purchases if you plan to buy a new car or go on an exotic vacation. You Need a Budget or YNAB helps you create a budget that it’s easy to follow. The app will plan for infrequent expenses, keep you away from overspending and teach how to live on the last month’s income. You will be able to focus on how to build a better financial life with an app that will do almost everything for you. With the HomeBudget, you can sync you personal budget between your laptop, smartphone and tablet. This means that you can share the home budget with the other members of the family. If you want to have a lot of control and do a lot of manual manipulation, then this app is the right option for you. Another excellent budget app is Mvelopes, which helps you keep your finances under control. You will link it to your bank account to make it work and let it manage your budget, help you pay your bills and plan your expenses. The app works on any device, but with the tablet app, you have more detailed views. Level Money is the perfect mobile app to help you stick to a budget, as it shows you what you can spend today, this week or this month. It detects your expenses and income and shows you how much you can spend. It can also help you pay down debt and save for bigger purchases. If you need an expense tracker for your spending you should try Wally. 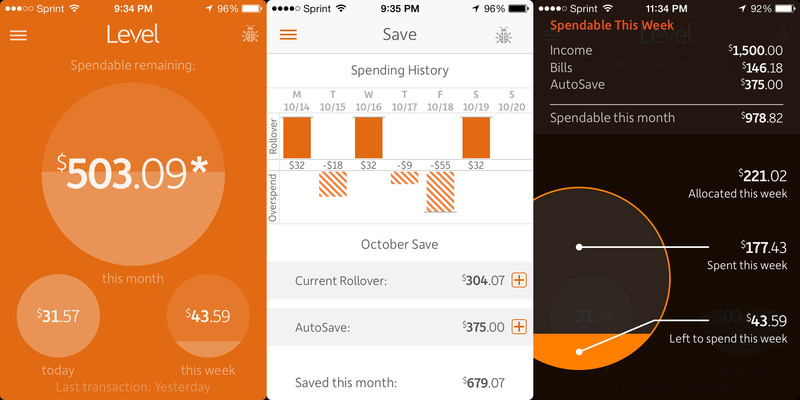 This mobile app tracks your expenses and will send you notifications when you hit a savings goal or when a bill is due. You can manually log your expenses by taking a photo of the receipt. With BUDGT you can quickly and effectively track your daily expenses. You just enter your income and your current expenses and BUDGT will show you an overview of your budget, how much money you can spend and how much you have left. You can also choose to get reminders, check out projections such as how much money you will have by the end of the week or month or log transactions in multiple currencies. This app is only for iPhone. The Albert budget app is one of the easiest and safest app that help you make smarter and better financial decisions. You simply connect Albert to your bank, investments, insurance, and loans and the Albert budget app will show you the actions that you may need to take. The app monitors your accounts so that it can help you find the optimal ways to use your money. Albert also identifies if you are spending money on subscriptions and what you can do to trim recurring payments. You will also get a financial health score which will help you determine what you can do to improve your financial status. The app is so useful that it can also show you when you spend too much on high-interest rates on cards or if you are overpaying for insurance. Through Albert you can also automate savings for example when you want to move money to a savings account. Us the app that you like most and you can keep track of your budget with easy to use dashboards and notifications that show you everything you need to know regarding your income and expenses. Now you have no excuse to let your budget out of hand. Bria Pierce is freelance writer with a keep passion in traveling and personal development. She believes in the power of motivation as well as hard work as keys to success. Bria cannot imagine her life without writing so it’s her occupation, her hobby and her way of living. Follow her on twitter.